When you want - or need - to master a new skill you'll be told to practice, but there's not always a lot of advice around on how to practice. Sometimes it's that hint about how to practice more effectively, how to approach the skill from a different direction which makes all the difference. Daniel Coyle has fifty two tips - most of which can be applied to just about everything from improving your golf swing to success in the business world. The tips are short - all fifty two are covered in about a hundred and twenty pages - easily read and simple to put into practice. 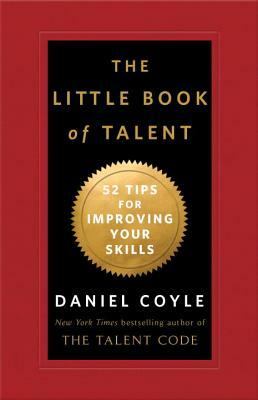 A few years ago Coyle looked at places which he called hotbeds of talent. They had success way beyond the average, such as the down-at-heel Moscow tennis club which had produced more top twenty tennis players in the last three years than the entire United States, or the music camp in the Adirondacks where the students achieved a year's progress in just seven weeks. There are a few similar examples and Coyle has looked at what they do and how this can be translated to other skills. Some tips are so obvious you wonder why you've never thought of them, such as carefully watching someone who does well what ever it is that you want to do. Others are counter-intuitive, such as practicing an action such as a golf swing as slowly as you can without making a mistake. You're reassured that you shouldn't fall for the myth of the child prodigy and regular naps are recommended. There are dozens more in this same vein: you're not going to follow them all - but they will all give you something to think about. Some you will know to be effective from experience and others will be worth a try.